My TEDx Talk, "The American Diet: a Historical Perspective"
On October 21st, I spoke at the Harvard Food Law Society's TEDx conference, Forum on Food Policy. The conference kicked off with three talks on nutrition, by Drs. Walter Willett, David Ludwig and myself. My talk is only 17 minutes long as per TED format, but it's packed with research on both quantitative and qualitative changes in the US diet over the last two centuries. It contains surprises for almost anyone, and I can guarantee you've never learned this much about the history of the US diet in 17 minutes. The talk was titled "The American Diet: a Historical Perspective"; you can access it by following that link. My talk has been online for a while, but I didn't post a link to it due to the fact that the slides were not synched properly and many of the graphs did not appear at all. I've been working with a gentleman at Harvard to fix these problems, and he recently finished a new version, which was posted online to replace the old one thanks to Food Law Society president Krista DeBoer. There are two problems with the talk I want to point out right away. The first problem is an error in one of my slides that a WHS reader recently pointed out. At 8:10, I have a slide showing changes in dietary fat composition over the last century in the US. I stated that polyunsaturated fat consumption has increased by 300 percent, but actually it has increased by 200 percent. It was a math error on my part. Each dot represents an individual study spanning 1961 to 2008 (1, 2, 3, 4, 5, 6). 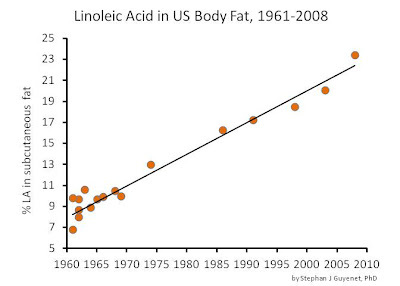 The increase has been extraordinary and corresponds closely to the large increase in dietary linoleic acid. The talk was better live, because it contained a lot of animations that don't appear in the synched version. But the video is a pretty good substitute. Enjoy! Can you clear something up for me? I was confused by the charts about the percentage of macronutrients over time. Sugar increased dranatically while cabohydrates as a percentage fell. Does this mean that there has been a bigger increase in meat/fat consumption. I ask as I have read statistics from both the US and UK that while shorter in time (30 years or so) show the ratios skewing to a greater percentage of carbohydrates. No agenda, no traps I am genuinely interested. Thanks for posting. As always you make many points that are well worth our attention. But I'm a bit baffled as to how you can consider the late 19th century "preindustrial." If anything America was far more industrial than it is now, with the majority of the working class doing heavy factory work, often 10 or more hours a day six days a week. The lack of obesity in the working class as they aged was due as much to poverty and near-starvation as it was the composition of their diet. There was no safety net, and many workers who had been laboring in factories since the age of 8 or 9 had such poor health that they could no longer work and were sustained by what their children (also working in poorly paid factories) could supply them. Working class mothers did not have access to birth control and the large size of families meant little food for everyone and of course all those pregnancies took their toll on women's bones and teeth. Teeth, BTW, is an extremely important issue. The lack of teeth in all classes by middle age had a lot to do with people's weight, as it is very hard to eat without teeth and dentures at the time were far from satisfactory. The reason people never smile in 19th century photos is that by their 20s many people had already lost many teeth and kept their mouths closed to hide them. Those who were affluent in this period were quite fat, and the female celebrities of the age would strike us to day as chubby--That was in large part because it was as hard for most Americans to get enough food to become fat in those days as it is for them to be thin now. My point here isn't that the changes in what we eat aren't significant, but that we have to be very careful to factor in all the historical and cultural changes that have taken place over this time period relating to diet, many of which are very good for the people involved, especially the 99% who are in far better health now and live a lot longer than they did in the 19th century. I think Jenny's comment is very much worth taking into account...but I'm wondering if the percentage of rural vs. urban adults figures into the equation. We were much more rural at that time and although living on a farm or in a farming community is no panacea food-wise, I suspect nutrition would have been much better than in urban settings. I picture the majority of 1800's farm workers to be typified by the Swiss villagers studied by Weston Price...hard workers but well fed with traditional food. A higher percentage of farm workers supports Stephan's assumptions more than a higher percentage of urban workers. Very well done presentation, Stephan. Well worth a look for anyone who hasn't seen it. Thanks for sharing your research. I really enjoyed your talk. While I've been reading about this topic for awhile now, seeing your graphics and the way you sum it up gives a good look at the big picture. The way you presented this, so easy to understand, I can recommend it those of us without a science background. Sincere thanks for your continued input there. And I'm sure those 'paleo' people need you and they just love that they can look credible with you being 'paleo'too. As for the lecture in general - I don't get it. I don't mean to be too critical but... erm... Have you just spent lots of time telling us that there has been a trend towards many people eating lots more fat and sugar - and fried or high fat foods that are super refined... And then you tell us there might be a connection between that dietary change and them people getting fat and sick? Fat peole eat a lot of vegetable fat! Why concentrate on that? (Please! not the grains industry conspiracy against the ever so poor and meek meat industry lobbyists). Just about ALL the fat people I know eat a a lot of animal fat in their burgers and eat junk. The one fat person I know who eats little meat eats a lot of ice cream (maybe it's the dairy or the wheat in the wafer she ate with the ice cream - or is there vegetable oil in the wafer?). Let's just blame the carbs. Or the lack of cholestorol. I've seen worse lectures, though. And the bit where you switched to the pretty girl with the Coke! I could murder a Coke. Even now, I want a Coke! All those years of paleo! RUINED. There was plenty of Coke advertising there (you do realise you advertised Coke - advertising works partly by being so insiduous) I doubt your pebble in the ocean will do any extra harm but next time ask Pepsi if Coke refuse to pay you. Jenny, the reason people don't smile in old portraits is that smiling for hours at a time is hard work. Try it. People began smiling in portraits when we got flash photography. It would be interesting to do a survey of portraits from the days of painting. Portrait painting was for the rich. How about all those plantation owners back in the day? They had plenty of food and slaves to do all the work -- the equivalent of modern household appliances. I recall no "fat southern gentleman" stereotype. Loved the presentation. It was quite eye-opening and very well done. Thanks! BTW - while drinking my coca cola, I wondered about the idea of sugar for willpower to lose weight you scoffed at - evidence based scoffing, I hope. Very roughly, my vague memory is that the science bit went: a little Carbs/protein/fat in a certain ratio (a possible technical term might be 'biscuit'), boosting serotonin levels in the brain before a meal increases satiety,whatever - you eat less overall and lose weight. Your appetite is decreased or something. And you feel great, apparently. Seriously, there is such a diet book out there with that kind of idea, not written by coca cola. I think you've got some of the harshest blog critics I have ever seen! Some of these people ought to get a hobby. Oh, wait. They have one, reading and critiquing blogs. I found the TEDx talk to be quite illuminating and further evidence to the fact that obesity really is good for business. It's a bit scary to think how far we've come from our old way of eating and even scarier to know that the science and the manipulation to create hyper palatable foods is trending upward at an alarming rate. More people need to be educated on this trend and learn how to shop and select produce, meats and grains that are not uber manipulated by science all in the name of profit. We vote with every dollar we spend on these sorts of foods. The less there is demand, the less supply. The more demand for organic, non-processed foods, the lower the cost. I hope more people read and watch this. Thank you, Stephan, this fellow UVA alum has been reading your blog for a long time and I very much appreciate the information you provide. Thank you for sharing your work. You do a very good job of explaining science to non-scientists. Cameo, selling food is good for business. Obesity is possibly a bi-product, not an objective. I do wish people would remember that all companies have the power to do is to create products they think we'll want. They can't force us to eat them. I doubt very much that most people are choosing to eat cheetos because they haven't been informed that junk food is a poorer nutritional choice than kale. 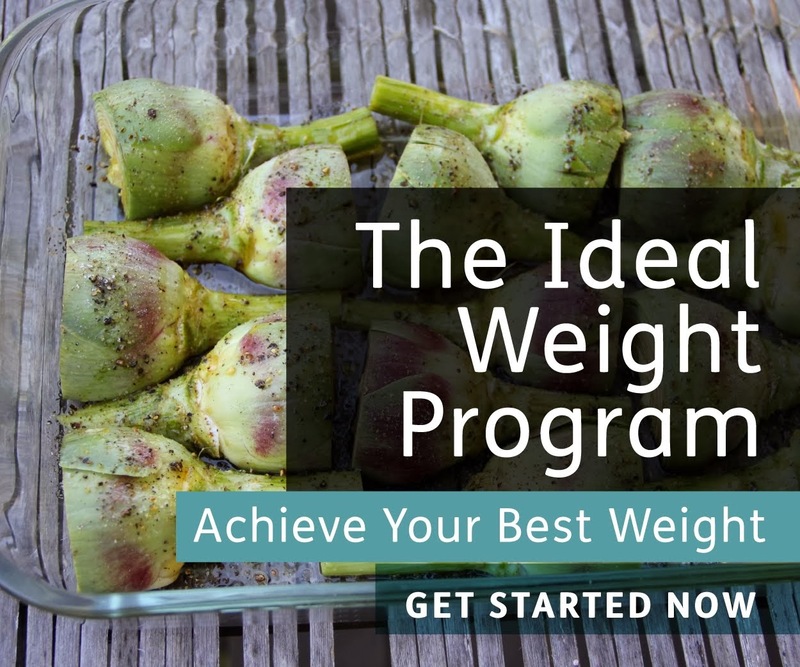 Deciding how we eat is an individual choice and all foods can be made more palatable and overeaten. Even at home. I don't know where you're getting anything in Stephan's presentation about scientifically manipulated grains and meat. The presentation offered statistics on sugar and processed food consumption, not genetically modified foods. But, I do think it's a bit ironic that today's socialites are desperately trying to mimic the near starvation diets of the poor you describe. The wealthier you are, the less acceptable it is to be fat today. Thank you very much for another excellent post. I really enjoyed that relatively short and easy to follow video presentation. You showed very clearly how the increase in refined sugars and the rise in the use of PUFAs has dramatically changed the makeup of our diet. Thanks again for a great presentation. Sossle, Stephan is doing this blog in his spare time. Unlike Taubes, he is not trying to sell anything and has no particular interest in your believing insulin theory, food reward or any other theory. Also unlike Taubes, he's actually a scientist actively doing research in this field. Maybe you should give him a break and question the idiocy of Amazon's Lil' Darling instead. Stephan, what a remarkable talk – kudos! Too bad about that slide being dropped; it is an impressive one. In talking about that “strawberry” milkshake, paralinguistic markers would be appropriate to emphasize that you’re talking, not about a food, but about a “food”. The unbundling of the artificial flavor overwhelmed even my jaded expectations. How can they get away calling it “strawberry” when “strawberry” doesn’t appear anywhere in the ingredients? Your statement during the conclusion that, if we’re looking for an explanation...for the obesity/diabetes epidemics, changes in the American diet, like the calories increases after about 1980, provide “a good place to start” is very modest and conservative. Excellently done! Interestingly, there has been a lot of research on obesity (lot of fat vs. lean) and growth rates, in chickens and pigs. I think it relates a lot to what is going on in America. In particular, for chickens, tweaking the amount of methionine in the diet controls the growth rate of the chicken (too little, or too much, makes the chicken eat less). Also, lower protein levels make the chickens overly fat. Anyway, in the past, Americans ate way more eggs, and less vegie oil. More vegie oil means more ROS, and less eggs means more calories eaten. After WW2, there was also more iron added to foods, which also increased ROS. So it's more than one factor, for sure! I'm trying to figure it out also. Nice talk Stephan. Congrats for making a Ted Talk. 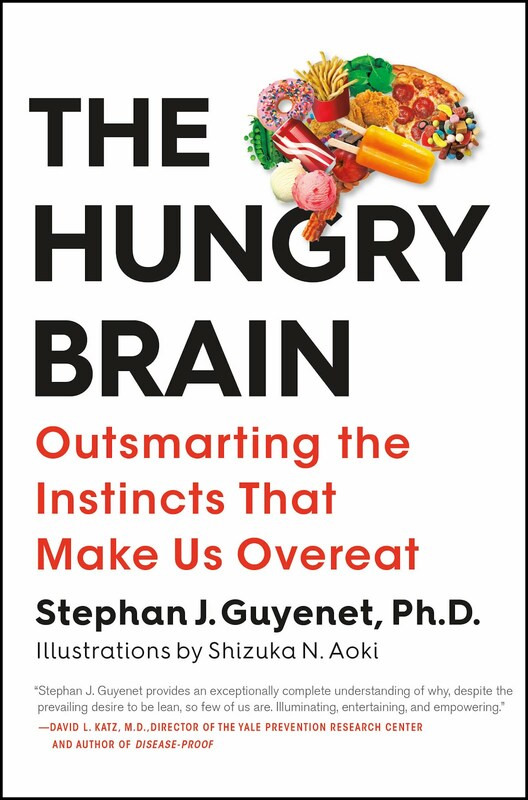 Looking at why we eat...or overeat....and attributing it to simply neurotransmitters is a bit over-reaching. (or palatably in your words) Correct me if I'm wrong there...It's just not that simple. I've mentioned this before in a blog response. Take for example depression. It results from a neurotransmitter imbalance...a shortage of chemical happiness...serotonin. Give the patient fluoxetine (Prozac), and serotonin levels go up. Then they are happy. Just one problem....experiments that lower people's serotonin, doesn't make them depressed. And there's the "Prozac Lag"....after administering fluoxetine, levels go up, but benefits not felt for weeks. Maybe this is attributed to neurogenesis and neo-synaptic genesis in the brain pleasure-centers. As Schopenhauer noted: people tend to treat causes "like a hired cab that one dismisses when one reaches the destination." A theme that I see a lot on diet and nutrition blogs is the notion that lean and healthy used to be the norm for human populations (leaving aside the ravages of certain infectious diseases), but then we messed ourselves up with crappy diet (pick your favorite food villains). "So Big and Healthy Grandpa Wouldn't Even Know You"
"Scientists used to say that the reason people are living so long these days is that medicine is keeping them alive, though debilitated. But studies like one Dr. Fogel directs, of Union Army veterans, have led many to rethink that notion." "The researchers focused on common diseases that are diagnosed in pretty much the same way now as they were in the last century. So they looked at ailments like arthritis, back pain and various kinds of heart disease that can be detected by listening to the heart." "The first surprise was just how sick people were, and for how long." "They discovered that almost everyone of the Civil War generation was plagued by life-sapping illnesses, suffering for decades. And these were not some unusual subset of American men — 65 percent of the male population ages 18 to 25 signed up to serve in the Union Army. “They presumably thought they were fit enough to serve,” Dr. Fogel said."" Thanks for posting that. I agree that people 100+ years ago had other health problems, which in sum were probably worse than today's problems. In particular, the US diet from 1850 to 1920 or so was heavily focused around white flour. Deficiency diseases, including goiter, pellagra and rickets, were common. I don't mean to idealize their health back then. However-- what interests me so much, and why I try to learn about them, is that they had very low rates of some of our primary health concerns today-- obesity, diabetes and heart attacks (the article said people back then commonly had heart disease, which is true, but it was typically congestive heart failure probably as a result of infection, rather than CHD). This is true even on an age-adjusted basis. So while I would never advise someone to eat white flour bread for 70% of calories, and I don't think the US diet of the late 1800s is a model of nutritional excellence, it is interesting and informative that in the context of a simple homemade diet, it doesn't lead to obesity, diabetes and ischemic heart attacks. Gary Taubes' insulin hypothesis, as well as the "eat less, move more" people- neither delivers as the solution to obesity. But what I think Gary Taubes deseres great credit for is brining up the valid points that obesity was significant in societies that did a lot of manual work and had poor semi starvation conditions. This is also conmfirmed by my ONW observations travelling and wathcing plenty of African videos. I see over significantly weight and downright obese African women and Caribbean women a lot. Poor areas of Africa had significantly over weight women. Have a look at THIS photo. This is just the scartching the surface of what I have seen and these women are not too bad ( center and right) I have seen more obese. ( I am not criticizing these poeple by the way - just pointing out that obesity exists in poverty a lot- like Taubes said) He is RIGHT about that. Now on to the health of people in the 1800's and early 1900's etc. Deteriming TRUE cause of death was ALSO VERY POOR back then- especially in regards to CAD which was not at all understood. I am sure many CAD deaths were improperly diagnosed. How do we know they did NOT have CAD? Remember even a CORONARTY ANGIOGRAM is VERY INACCURATE. If IVUS had been performed on these people from 1800 THEN we WOULD know for SURE Ifif they had CAD or not. I really like your website. I'm learning a lot of great health information from it. Thank you. Nice blog dear! A many information is very useful for me. In your blog provides, many beneficial, health concept and etc. Thank you very much man. I want to thank yourself, Richard Nikoley and Sean Croxton for emphasizing the most important dietary principle of eating simple, natural wholesome, real unprocessed food. I have found something out. Industrially procvessed food is not beneficial for human cellular heath , as we know. An explanation for this could be this: Most CANNED products are lined with bishpenol A ( or BPA) a plastic chemical that causes HORMONAL CHANGES stronly linked to heart attacks, OBESITY, and certain cancers. I knew toxins played a role in coronary artery disease and obesity somehow, just as my friend Urgelt suggested.